Great, you’re exploring maps for Salesforce! 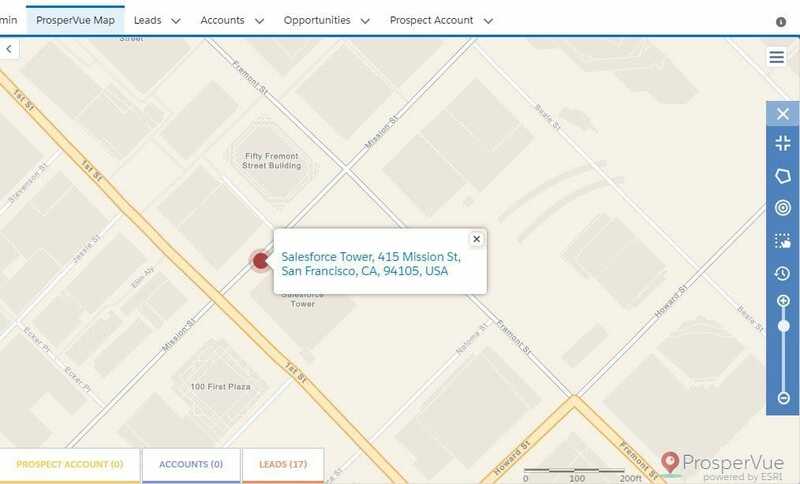 Most CRM data can be shown visually in Salesforce maps, with Google Maps or Esri ArcGIS. 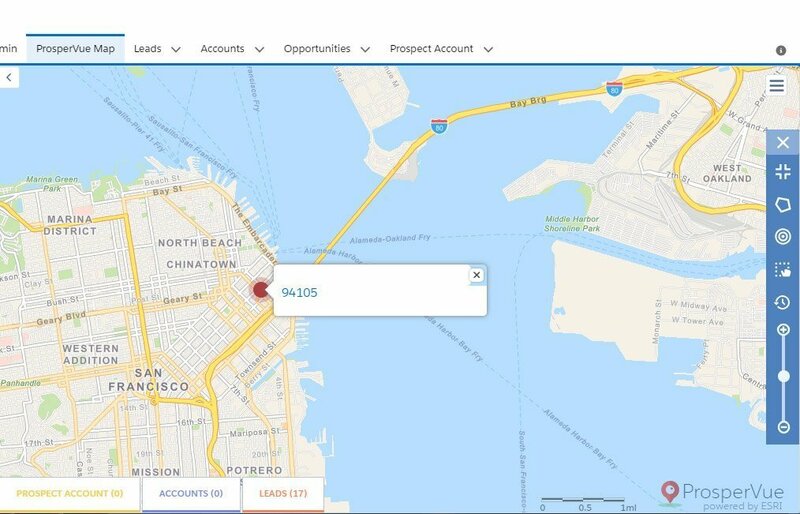 The location intelligence can easily show you new opportunities. So you compare apps and check out features to use. Case studies show you the potential. Perhaps you downloaded a trial. But then, it’s not uncommon to get less than impressive results with the first go-around if you are new to mapping your data. If this happened to you, it’s fixable. It’s time to clean your address data. Let’s look at how to do this. This is what a map uses to pinpoint and display a location. We’ll show you tips to improve each of these. When all the above five address fields are available, you get the most precise location. It’s called “rooftop” geocoding. The pin sits right on the building in Google Maps! 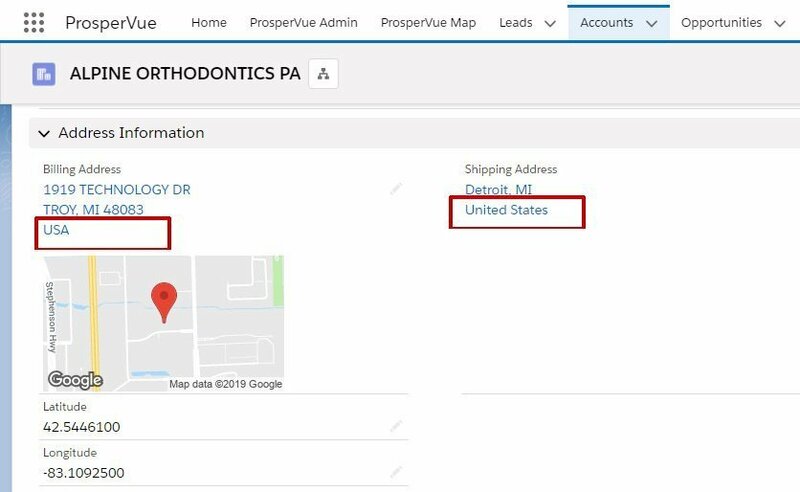 Our ProsperVue for Salesforce demo uses mailing address, so our pin sits at the street address where mail is delivered. When less info is available, it’s still possible to map. But the location will be less precise. For example, when only ZIP is available, the software will place the pin in the middle of the ZIP area. This is called “approximate” geocoding. Whether this is precise enough for you or not depends on how you will use geolocation data. If you have a mix of “US,” “U.S.,” “United States” and “U.S.A,” in the Country field, choose one and make them all the same. You may also find City, State and ZIP in the Country field. Be sure that data in any field is an acceptable value – e.g. cities in City fields, countries in Country fields. If you only have city for a record, add state and country. Append or update addresses through an external service all-at-once, or during the sales process which will take longer. When you lack all location data, convert non-address data into latitude and longitude were possible. The non-address data should have some relationship to geography. You might have to be creative to see possibilities. As one idea, a phone number can be converted into an approximate ZIP code, because area codes are based on location. Coverage is about how much of your data is present and not blank. If you do not have most of these fields, a latitude and longitude cannot be generated, and thus the record cannot be displayed on a map. There are multiple sets of address fields in some objects. Use fields that have the least number of blank records. Some child objects depend on a parent (like Contacts is a child of Account), so make sure you are using the address fields from the appropriate object. Sometimes addresses are put into other text fields out of convenience or as a short-term fix. 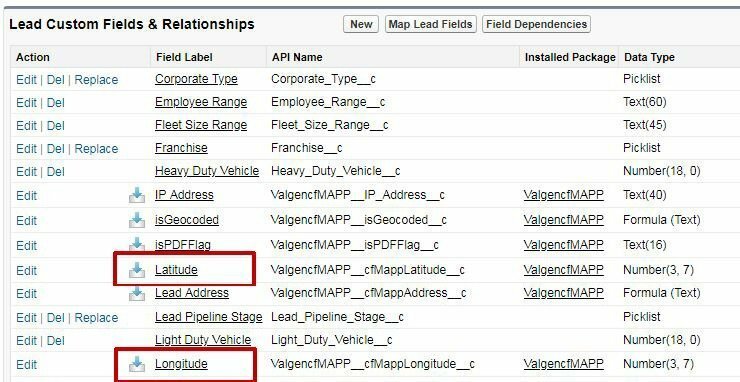 Scan all fields in the Salesforce object to bring in the necessary address fields to use. Have your sales team add data when talking to a prospect – but, not to the point of distracting from the core work of advancing the pipeline. Using the sales team could be a conversational opportunity or a productivity-buster. Another way to fill in blank data is to carryover the address when converting a Lead to Account, or Account to Opportunity. Be sure address fields are accurate and up-to-date. Address text fields are easily edited by anyone, so they often have a lot of junk. Also people and companies move, new buildings and streets are built. Bad data may cause incorrect geocoding. You can do this with in-house software or use a service bureau. As a bonus, service bureaus can also identify address changes (also called NCOA or National Change of Address). Check if the wrong type of information is entered in fields. For example, phone numbers and email are often found in the address field. Once you’ve cleaned address data for geolocation, you want to keep it in tip-top shape going forward, so future records are mapped. Run address standardization (CASS) every 60 days using in-house software or external providers. Don’t let users manually enter address data or override it. Use a separate field for manual entries and edits. Then use a verification workflow and update the field. Turn on the Salesforce standard picklist functionality for State and Country fields, to avoid spelling errors and inconsistency. Now you should be able to the most from geolocation! 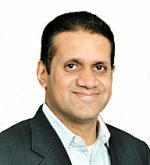 Did you run into any unusual data quality issues? Tell us about it, if there’s something we can help you with, we’ll be happy to guide you. P.S. – For a real-life story, see our blog post about how a client was doing business in 7 countries, but their data showed 107 countries! 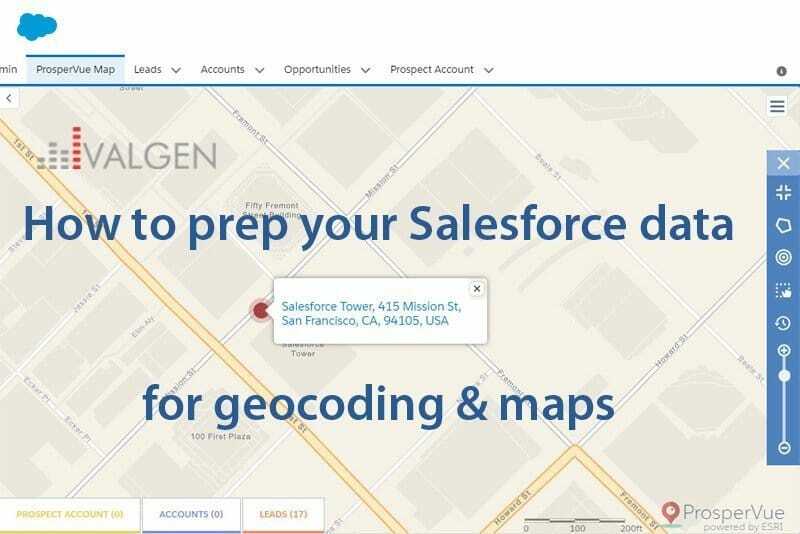 They did the fixes shared above, and have successfully used our Salesforce geolocation app (ProsperVue) for many years.